Posted by Kelly on Aug 16, 2014. I’ll be taking a bit of a break this week from SN. Last evening we had to say goodbye to Toby. He had started to experience heart failure back in May but with many drugs, he was able to come out of it. Sadly his heart started to fail again this week. It was time. Thank you Toby for almost 10 wonderful years. You were the sweetest and most beautiful Sheltie I’ve ever known. You never met a stranger and everyone who met you wanted to take you home for themselves. You will be very much missed by a lot of people. MY heart breaks for you. We are going through the pain of pet sickness as only a true pet owner knows how. Yesterday I Googled “Why do I cry for the sickness and death of my pets but not my human parents” ? I pray for all who grieve for loved pet companion. I’m so sorry for the loss of your poor puppy. It’s so hard to say goodbye. We’re all with you. So very sorry the loss of your little fur baby. We have lost 3 Sheltie babies and it is never easy to say good bye. We just look back at all the times that they make us smile. My heart broke when I read the sad news about your beautiful Toby. It is the hardest thing we have to do when it’s time to say goodbye and also the most brave. My wish for you is that soon, the hole in your heart will be filled by all the warm and wonderful memories you have of him. Oh Kelly, I am sitting here in tears. Bless you, my dear… and bless your beautiful Toby. Your precious angel is free. Until you meet again.. until we all meet our beauties once again… our hearts then will be free. I am deeply saddened from your loss of Toby. I have been praying for you all week. I pray that you and all who have loved Toby over the years, have had some peace and closure. I have had 4 Sheltie’s over the years. I Love the breed so much. I have a 28 lb Sheltie now, his name is Buddy. I adopted him from Second Chance Sheltie Rescue here in St.Louis when he was 3 years old. Buddy is 9 years, 4 month old, he is such a sweet little boy. I also have a little girl, a Sheltie / Border Collie Mix, her name is Abbey-Girl, she is 9 years 8 months old. I’m praying for you and all who were close to Toby over the years. Toby was as adorable as a Sheltie can be. When they have lived a full lifespan it is still very hard to lose our dear friend but when we counted on more years together, it is ever so much harder. My heart goes out to you in your sorrow. These dear dogs of ours live life in the fast lane — they are ready to reproduce at less than one year of age and by seven they are considered seniors. At best, our time with them is all too short but the little fur angels were never meant to spend long on this earth before returning to heaven. We love them with all our hearts and then learn to say good bye all too soon for having loved. Still, I wouldn’t have missed a one of my beloved dogs for fear of their passing. It’s the bargain we made when we took them into our hearts and the last thing we’d want is to pass first and leave them alone. We miss you too and hope you’ll be back to us soon. So sorry for you loss……. try to remember all the good times and joy that your special Sheltie brought you. They are all such sweet souls. Leaves a hole in our hearts when we have to let them go. My heart breaks for you! It’s so hard to say goodbye & I’m saying prayers for you. All healing sent to your heart. I’m so sorry to hear about the loss of your sweet Toby. I loved to see your adorable pictures of him, especially when you had him in his bow tie. My thoughts go out to you and your family in this difficult time. My deepest condolences on the loss if your beloved Sheltie, Toby. It is never easy to loose a beloved pet and I wish it wasn’t something you had to endure. May the loving and fun time memories be of comfort to you and help to ease your sorrow. We too have lost 3 shelties much too soon 2 at 11 yrs. and last September our 14+ yrs. It is so hard to say Goodbye to our wonderful best friends. and our 3 at home. So sorry for your loss of Toby. It looks like he was a very special little soul. So very sorry for your loss of Toby. I loss my beloved Winston 5 years ago at age 10. It’s so unfair to have to say goodbye before it is time. We still lite candles every year on the day he died to keep my promise that I would never forget him. I never filled in the hole under a bush I always yelled at him for digging. I didn’t allow any of the dogs in his spot but a few days ago my old foster sheltie dug up the spot and was laying in it. It made me laugh to see to him there and not that empty hole. Time and foster have helped fill that hole in the ground and my heart….it will for you too. Kelly, I’m so sorry for your loss of such a wonder friend. He was such a handsome boy. Every time I see his smile it always bring a smile to my face, I’m sure he had that effect on everyone. And he can continue to bring a smile to everyones face who comes through the Rainbow Bridge on they’er way to Heaven. Rest in peace, sweet beautiful Toby. Run and frolic in the lush green fields at the bridge with your heart whole and strong again, full of just as much love as ever. My heart goes out to you and your family. Toby is now with Trevor at the a Rainbow Bridge, waiting to see you again someday. I am so sorry. Thank you for sharing your dear babies with us. They are so precious and 9 years is too short. Kelly – I am so sorry for your loss. I think we know that we will outlive them but it is never easy. Each one gives us a special gift – Trevor and Tyler for you and my girls for me. Each one brings joy – pictures bring us memories. I am so sorry for your loss. It is the hardest thing to say goodbye to our furbabies. It sounds like you gave Toby a great life and lots of love. You and Toby are in my thoughts and prayers. Take care. God bless. Shelties capture our hearts with their incredibly sweet nature and courageous spirit. Toby’s dear expression says it all. We all share your sadness and hope your precious memories of all the joy you shared will comfort you. Our thoughts are with you! JoAnn and Gary and Penny too. There are no words, Kelly. I’m so sorry. It isn’t good-bye, but until you meet again. So sorry for your loss .It is so hard when you loose a fur baby . Thoughts and prayers are with you at your time of sorrow. Please take care. That little sentence is seen on many Sheltie collectibles & it’s proven to be 100% true since Shelties are a special breed that somehow have a knack for working their way into our hearts in an instant. His paw prints will never fade & your Toby will be waiting for you, no matter how many years go by until it’s time for you to go too. My first Sheltie passed in 1996, my second in 2008 & I miss them both as much now as I did on that first day after they made their final journey. There is no heartache that can be equated to that of losing a beloved pet & my heart hurts for you today. After reading your post & before writing this I went to hug my current Sheltie, MacKenzie who thankfully, is still going strong at age 12. Obviously I have many paw prints on my heart & they will always be there. Toby’s will be on yours too. Tears came to my husband and my eyes when we read your post about your Beautiful Toby. We love our sheltie; Cooper so much, it’s hard to imagine life without him. I know the heartache you feel now as you mourn the loss of a true family member. It’s quite obvious that Toby had such a loving, fun home-he was one lucky boy! Thank you so much for allowing us a glimpse into Toby’s world. 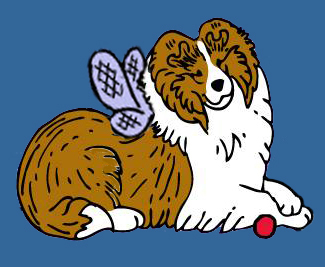 He is running freely in “Sheltie Heaven” and I hope he meets up with our Cody (he passed 4 years ago at age 4). Every second, minute, day, week, month and year you had with him was a blessing for both of you. May your heart feel more happiness in the days ahead knowing you had each others companionship for 10 years! lucky to have him in your life – even though it was too short. Blessings to you and dear Toby. Thank you so much for sharing Toby with us over the years. His sweet expressive face epitomized all the characteristics of this special breed. He will be reunited with Trevor and they will frolic in heaven together. My mother had her lovely Sadie for 8 years and I assured her that She and Sadie would be reunited and Sadie would jump in her arms. It took her 3 years to get over losing Sadie and she got Ceilidh started for me as I could not leave a puppy alone all day. My sister and I bought Penny for her and she enjoyed her for 4 months. Hold all your precious memories in your heart and be comforted that you will be reunited with your precious babies and all members of the Sheltie Nation will have you and your family in our thoughts and prayers. I am so very sorry for your loss. I know that words are little comfort at a time like this for the bond and love that we feel for our furry companions are incredibly deep and make their passing so incredibly painful. They touch our hearts and souls in ways that people who have never had the joy of that special relationship can ever understand or truly appreciate. You were both so lucky to have had each other in your lives. In time the intense grief that I imagine you are now feeling will pass but the memories will last forever. I trust in the future you will be able to look back and rejoice in the time you had together. I also share your loss in a family way as well. Tobby’s father, Zion’s Man About Town, was the grandfather of my older Sheltie, Jamie. Tobby’s passing is a loss to all of us in the Sheltie Nation. I Googled “a sheltie named toby” and came across your posting. I got my Sheltie when I was 9 years old and named him Toby. He died when I was 18. I’m 61 now, and I still miss him. I know how much you miss your boy.